The perfect solution to tuning a bagpipe chanter quickly has arrived. Now you can tune your chanter very quickly by simply turning the tuning dial to raise or lower your reed - while you continue to blow your pipes! You know that McCallum’s experience making bagpipes and pipe chanters are second to none, so we are thrilled to be working together on this chanter. Their interest in making a well balanced, refined instrument with bright tone is evident in all of their products. Each chanter carries the McCallum Bagpipes marking, your guarantee of workmanship to the highest standards. The Campbell Chanter is based on McCallum’s Mark III design that offers a winning combination already recognized throughout the piping community. With comfortable round holes, this chanter presents a bright sound with brilliant projection and stability. Check out our stunning new chanters with classic engraved nickel soles. Order the engraving of your choice to match your existing pipes. Click here to learn more. Congratulations goes out to PM Tyler Bridge and the Guelph Pipe Band for capturing the 2015 Grade Four Champion Supreme title in Ontario, Canada. Click Here to watch the band playing a wee set with their Campbell Tunable Chanters. A very helpful instruction manual has been added to the “Learn More” page of this website. Be sure to take a look as there is a unique bagpipe tuning option on the last page. Kyle Campbell of Winnipeg has seemingly solved reed adjustment hassles with a patented new mechanism…Pipes | Drums magazine. Mike Paterson, a writer from Piping Today Magazine wrote an article about the story behind the Campbell Tunable Chanter. Read more. “Just got the chanter in today. This thing is amazing. So intricate and sounds phenomenal. It’s so much better than my previous chanter. I don’t even need any piper tape on the holes. I will post a picture in the next email from my next bagpipe gig. At the end of the month. 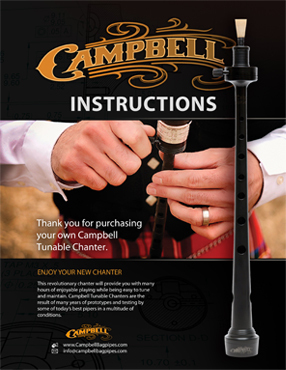 “I have played the Campbell Tunable Chanter for 2 years and have found it to be well constructed and intuitive to use. The ability to quickly and easily sink or lift a reed without having to stop blowing or remove the chanter from the bagpipes greatly reduces the time needed to adjust to the current environment.